Thanks to the generosity of an esteemed member of Chabad, our shul has received a beautiful new Memorial Board. 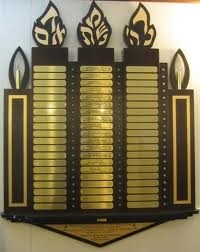 The board is a great honor for all of the precious souls that are perpetuated in our shul. This beautiful board is a masterpiece, custom-made for Chabad of Islip. If you would like your loved ones memorialized on the new board, please let us know. There is no doubt that their neshamot will be comforted throughout the prayers and Mitzvot. The magnificent Memorial Wall offers dedication opportunities for your loved ones ensuring that a Yahrtzeit is never missed. For $360, your loved one's name and Yahrtzeit date will be displayed on a plaque. Each year during the month of the Yahrtzeit the flame near your loved one's name will be lit and will flicker in remembrance. Payment plans are available. Contact us at 631-913-8770. 2. I would like to dedicate 0 1 2 3 side candle/s for the Memorial Wall at $1,800.00 a candle. 3. I would like to dedicate 0 1 2 3 4 5 top plaque/s for the Memorial Wall at $1000.00 in honor of the 6 million that perished in the Holocaust.